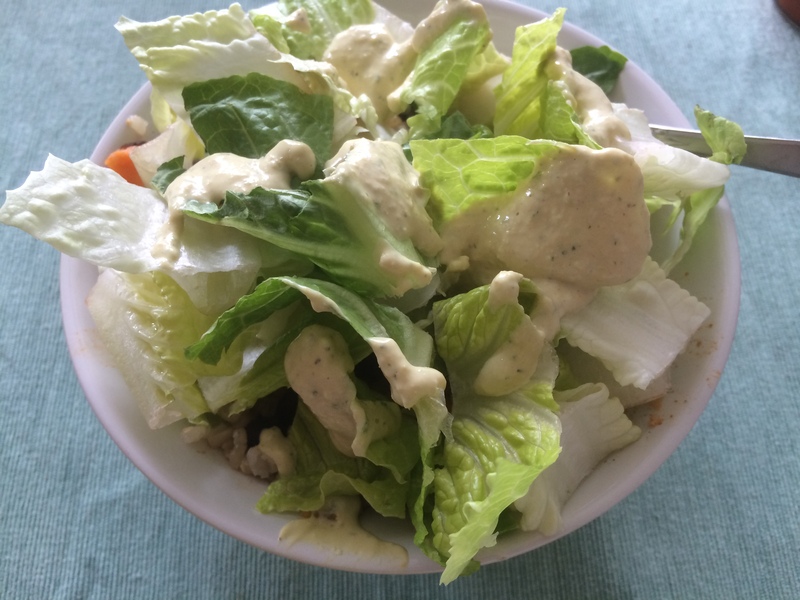 Salad dressings are one of those things that I always have around, because I eat salad daily, but I don’t like to buy them because 1) they’re expensive and 2) there are so many added unnecessary and unhealthy ingredients(though Newman’s Own does a pretty good job with some of their salad dressings). 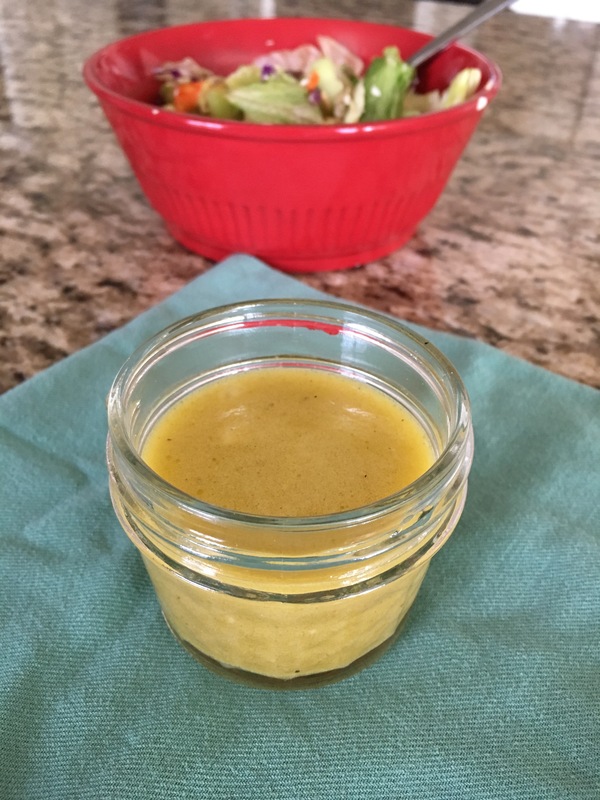 Making a salad dressing is simple, fast and inexpensive so homemade dressings have become a staple in our house. Apple cider vinegar has some pretty amazing health benefits, but I am not one of those people that can just drink a tablespoon or a watered down glass, straight up. 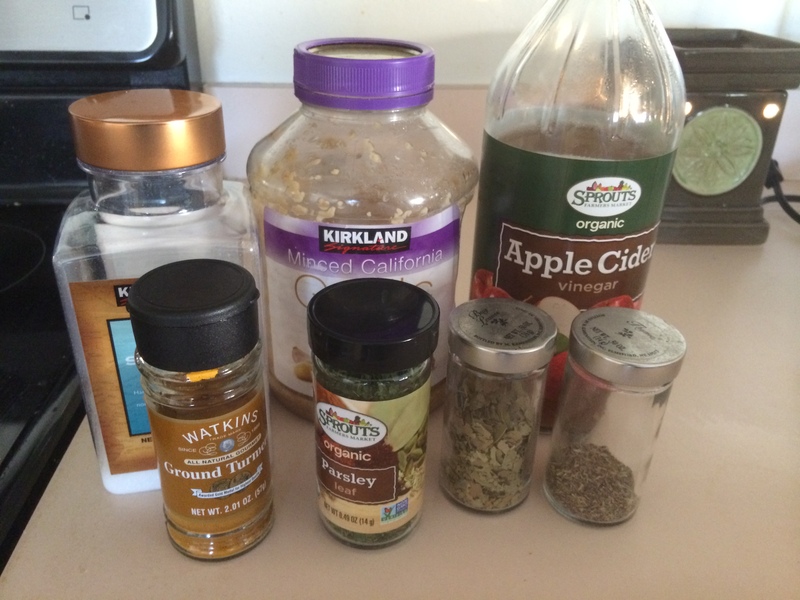 This is a fabulous way to get some apple cider vinegar into your body! 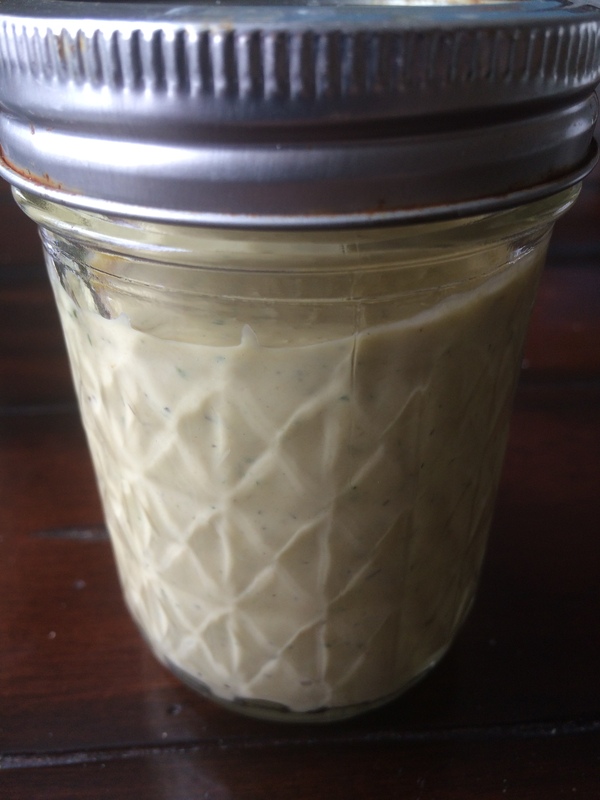 I love this dressing on any of the green salads I make. 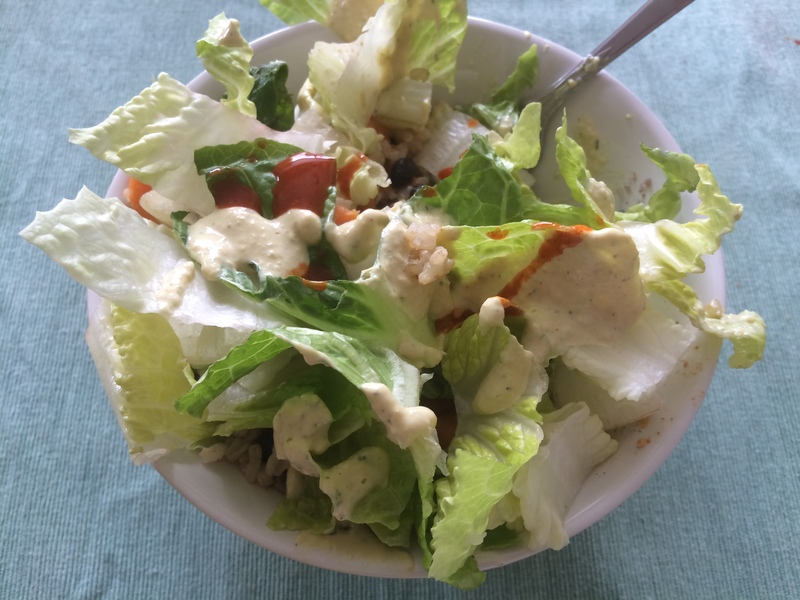 The one pictured below has romaine lettuce, carrots, cucumbers, bell peppers, tomatoes and sunflower seeds. And you can totally do this recipe with or without the maple syrup; I would try it first without and then if you feel like it’s too bitter, add the syrup. I like it both ways though my kids prefer it with syrup. 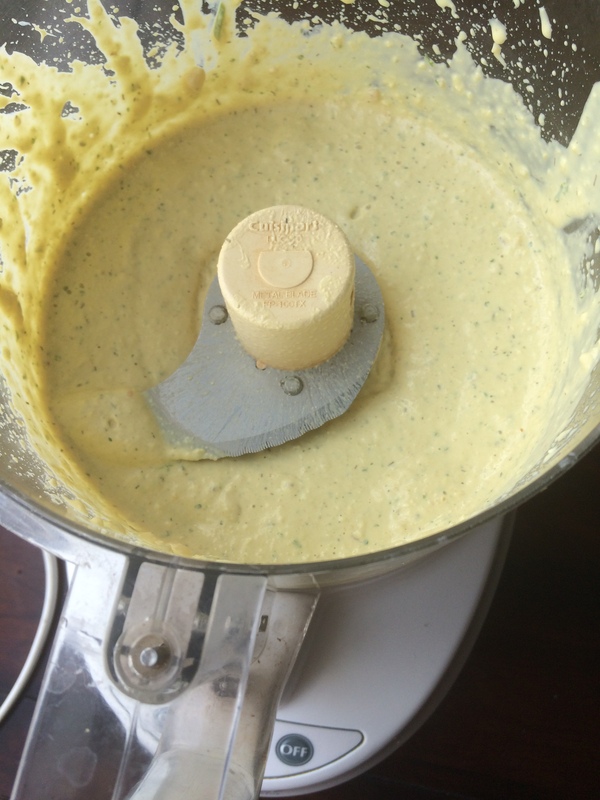 Combine all ingredients in a glass jar with a lid and shake vigorously until emulsified. Pairs beautifully with any green salad. Can be stored in the fridge for up to 1 week. I like to buy the Costco Rotisserie chickens on occasion (which are hormone free). 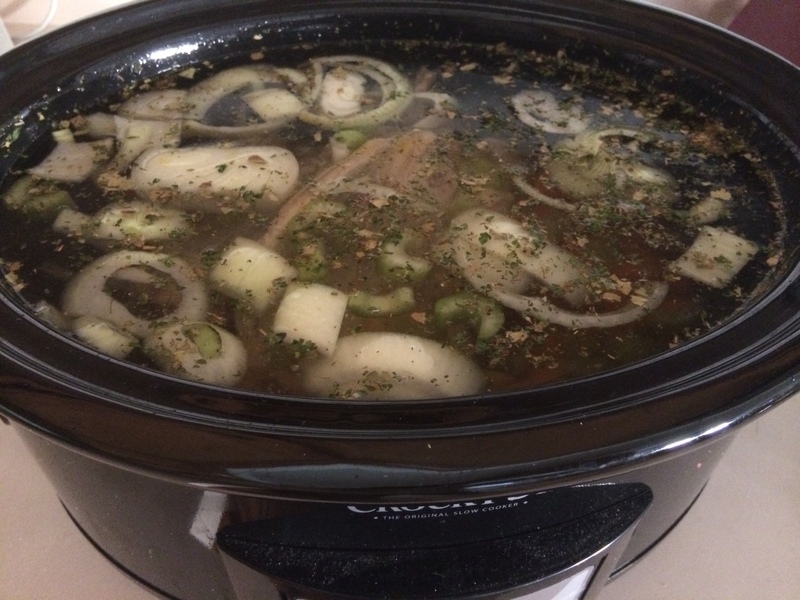 When I do, rather than throwing the carcass away once we’ve pulled off all the meat, just before bed I’ll stick the carcass in our slow cooker, add in some veggies, spices and water, and cook it on low, overnight. 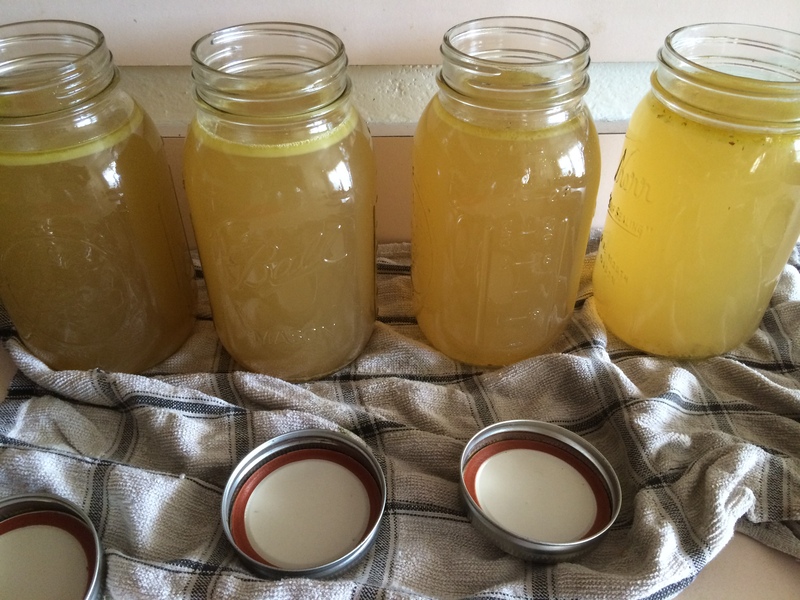 When we wake up in the morning, the house smells amazing and now we have several quarts of home made chicken stock! I know in the picture below, I’ve chopped up the celery pretty fine, but I never do that any more. There’s no need. It’s just for the flavor and you end up dumping the cooked veggies. So instead, using my end, I break the celery stalks into thirds and toss them in. These are the spices I use, but feel free to take some liberties here and add spices you love that would go well with the others, or you can leave some out that you don’t have on hand. Once the veggies and spices are in, I fill up the slow cooker with cool water, leaving about 1/2-1 inch headspace at the top. Put the lid on and let it cook on low overnight or 8-10 hours. Once it’s done, turn off the heat and use a soup ladle to pass the stock through a fine sieve to remove all the solids. 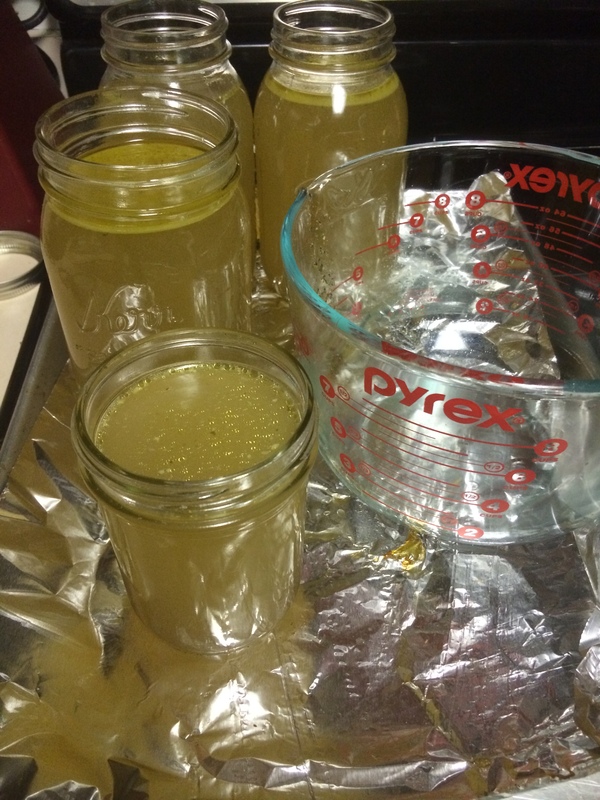 You can put the sieve right over your jars and ladle it straight in there or you can ladle it into a larger container first, like my large glass measuring dish, and then pour it into the jars. Either way it gets pretty messy so I usually do my ladling work over a rimmed baking sheet. The stock is amazingly flavorful and will go well in all your soups. 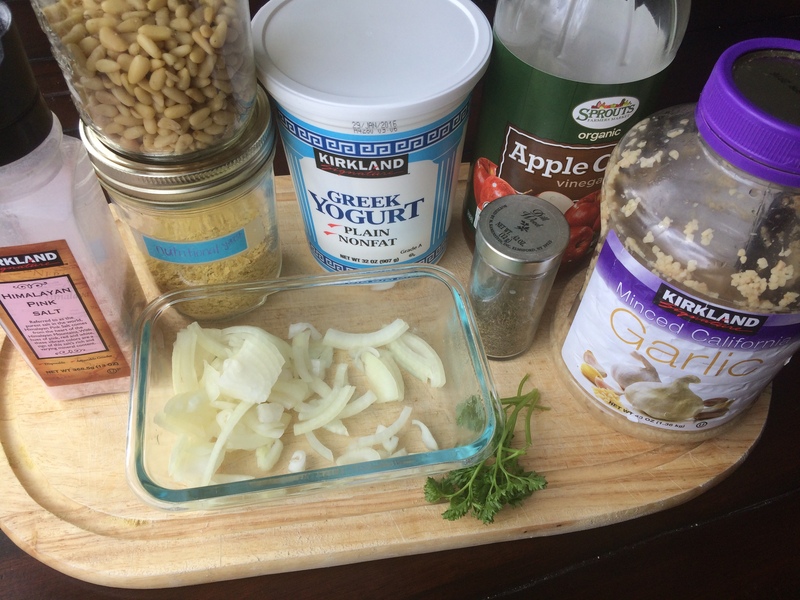 I also use it in my enchilada sauce and when I’m making brown rice. 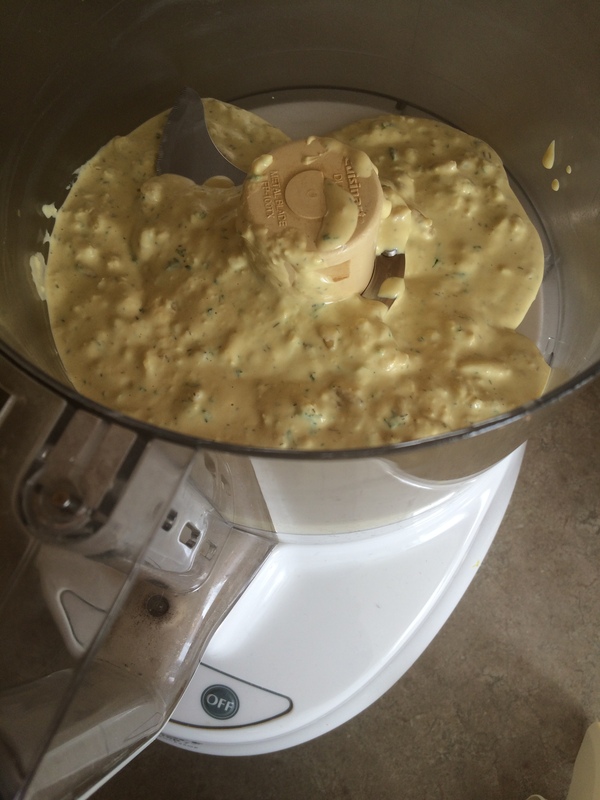 It will keep well in the fridge for a couple of weeks, or you can freeze it for several months. 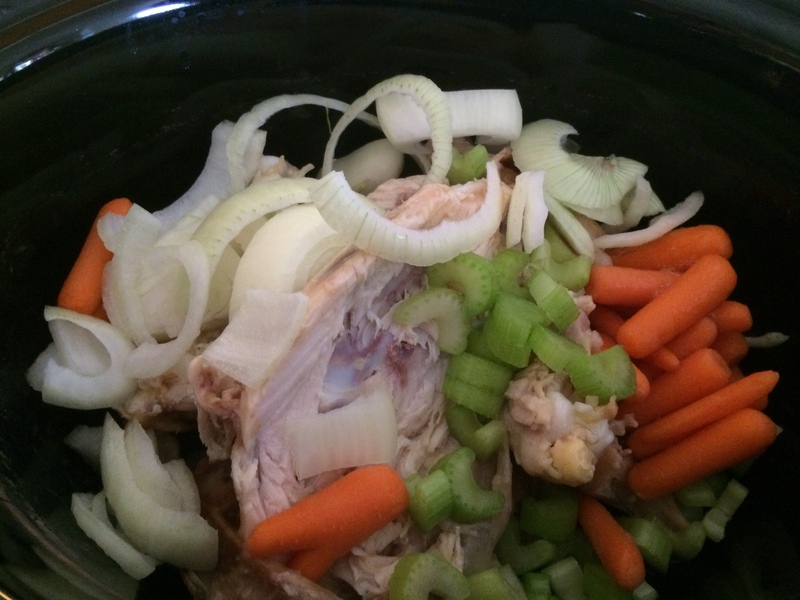 Place chicken carcass in large slow cooker. Add all other ingredients. 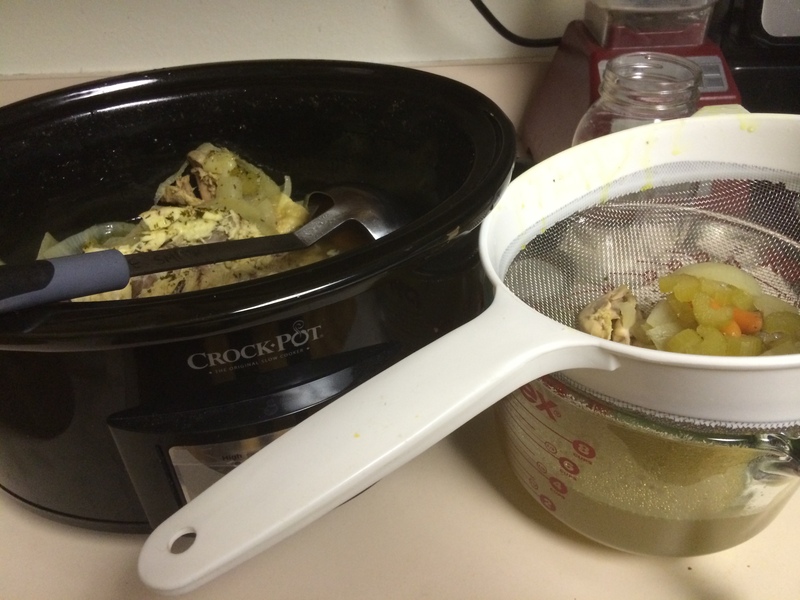 Fill the slow cooker with water, leaving about a 1/2 inch head space at top. Cover and cook on low overnight or start in the morning on low and cook for 8-10 hours. 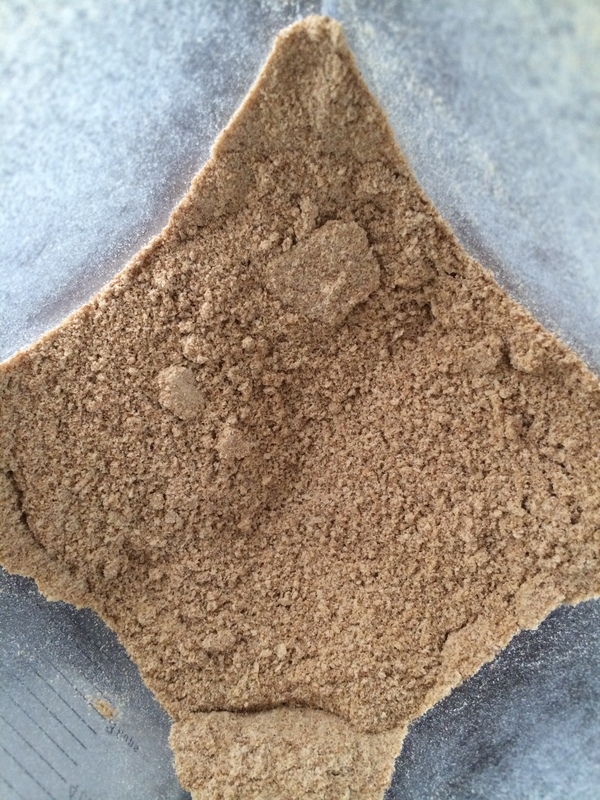 When done, turn off heat and ladle the stock through a fine sieve to remove all the solids. Store in glass quart/pint jars. Refrigerate for two weeks or freeze for several months(I like to freeze mine in quart freezer bags because my glass jars always break in the freezer). Can dilute stock with water when using in recipes or use as is. 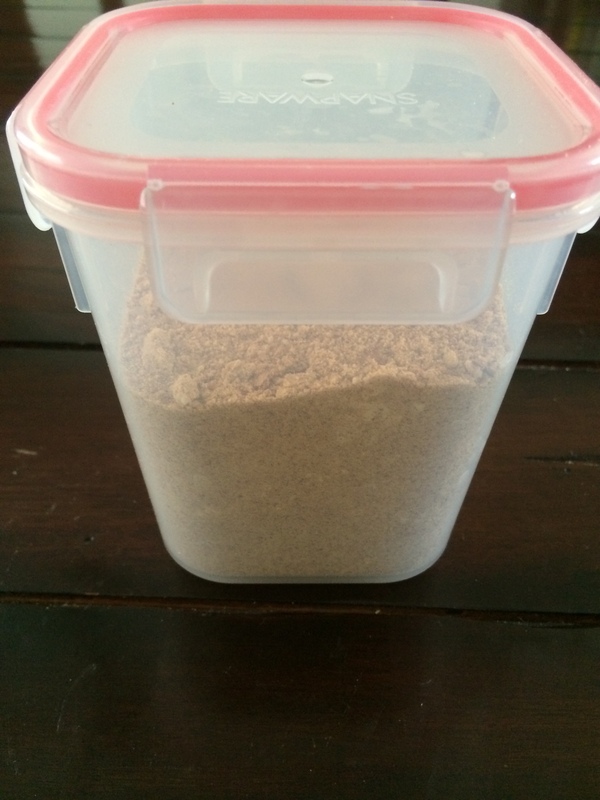 I have a couple of family favorite recipes that call for bread crumbs. Have you ever looked at the ingredient label for bread crumbs? There’s a whole bunch of extra added things that we really shouldn’t be putting into our bodies, and I always prefer whole wheat to white, so we like to make our own. This has become a staple in our house. 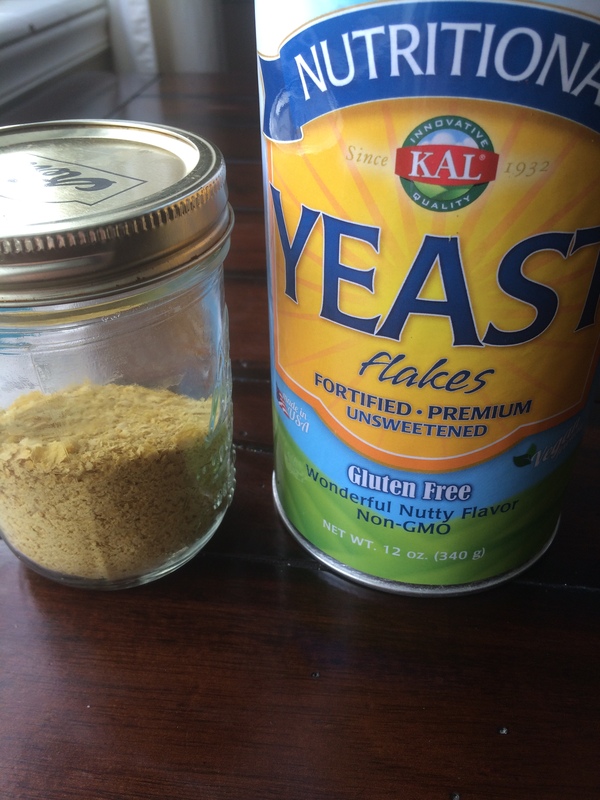 You can make bread crumbs using your favorite whole wheat bread and I love that it uses up my end pieces! You don’t have to use end pieces, but I always do because my family doesn’t enjoy eating the end pieces in sandwiches and I don’t want them to go to waste. So I save my end pieces by freezing them either in their bag or a freezer ziploc bag, or if I already have some frozen end pieces in the freezer, I’ll just add more to it. Once I have 8+ pieces, I’ll pull them out of the freezer, put them on a cookie sheet and bake them in an oven preheated to 300 degrees for about 30-40 minutes until they’re dry and crispy but not burnt. Once they’re ready, I break them apart into fourths or smaller and stick them in my blender. 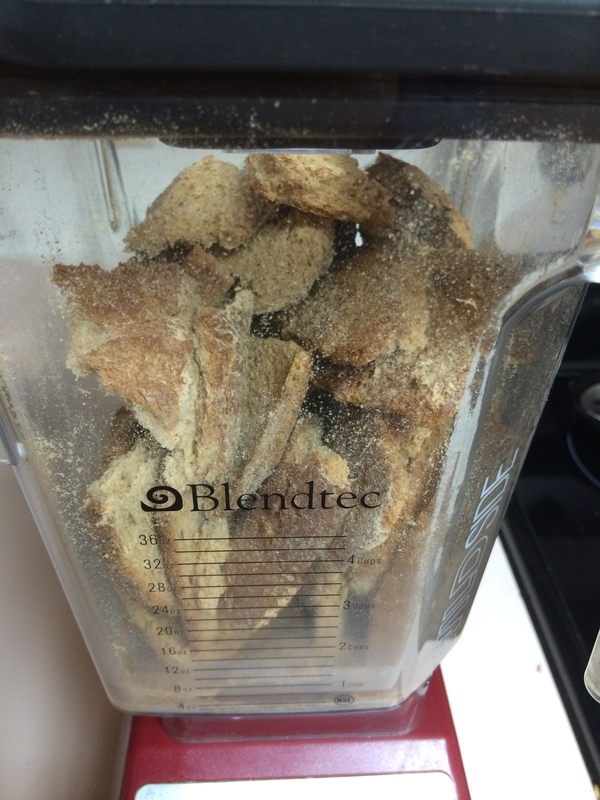 I pulse the blender until they break up into smaller pieces. Sometimes a big piece will get in the way and trap the others from falling down toward the blade. When that happens, I just open up the lid, break some of the larger pieces down to smaller pieces, replace the lid and pulse again. After you pulse it multiple times and the bread is no longer getting trapped, hold down the pulse button and allow it to blend until you have crumbs, about 20 seconds. 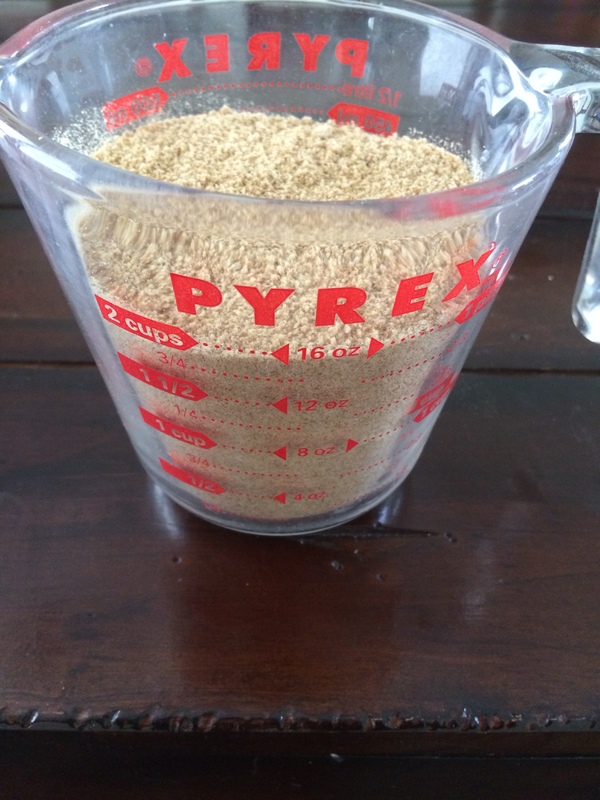 8-10 slices will make about 2 cups of whole wheat bread crumbs. Whatever you don’t use within in the next several days, feel free to freeze them in a tupperware to be used another day. And you don’t need to let them thaw, just pull them out of the freezer and use. Preheat oven to 300 degrees. Place bread ends on a baking sheet, not overlapping, and bake for 30-40 minutes until the bread looks toasted (dry and browning). 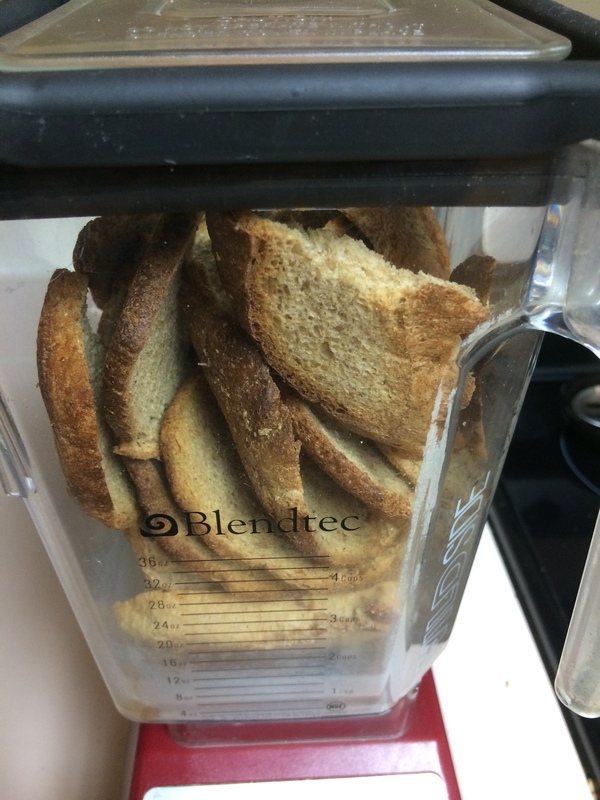 Break bread into fourths and place in high power blender or food processor and pulse about 10 times, until the bread has begun to break up and then hold down the pulse button until it’s all crumbs, and there aren’t any more chunks, about 20 seconds. Ready to use immediately in recipes, or you can store in pantry for several weeks or in freezer for up to a couple of months. We love to use bread crumbs on our chicken fingers (chicken nuggets/strips).